What Happened To My Bosu Ball? No Wonder Japan Has Only A 3% Obesity Rate! My New Pink Hat--What A Nice Surprise! 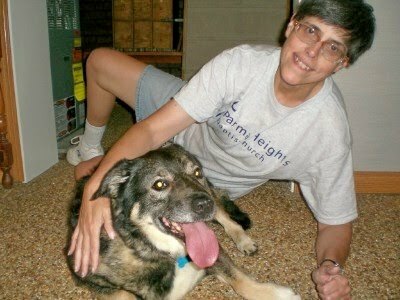 Gerard's favorite, of course, has to be Abby Finds A Good Home--From Death Row to Adoption. Since he already wrote his review on it, I just included the link. 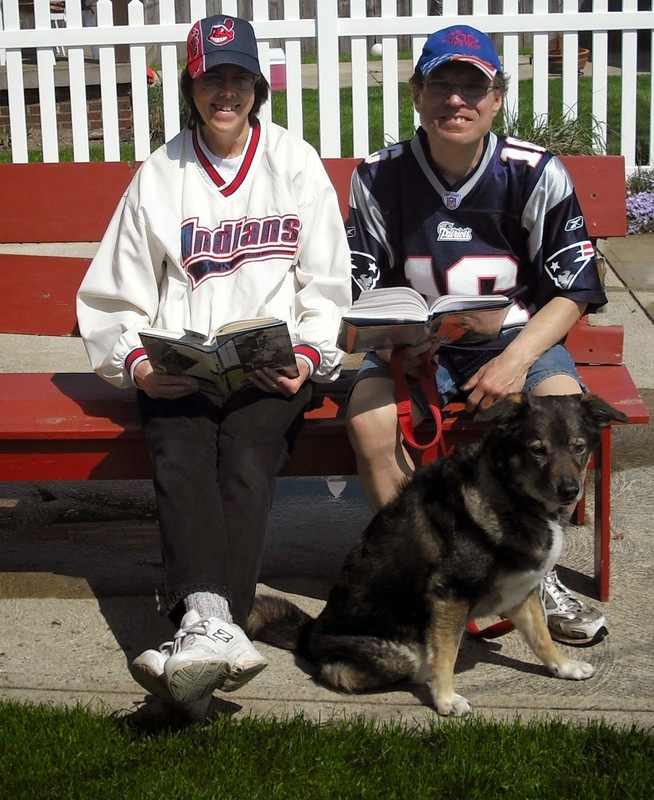 Karen's favorite and Gerard's second favorite is House Rules by Jodi Picoult. Click on the link to read our review located on our new book blog, "Grab A Book From Our Stack." Take a look around while you are there and let us know what type books you like to read. It will help us know which reviews to post--between the two of us, we read pretty much everything except for fantasy and science fiction. I got bored with my same blog designs and in an effort to declutter, decided to start a new blog for just our book reviews. 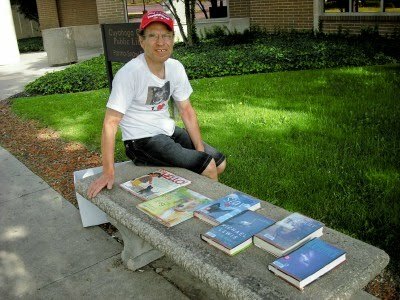 They were buried on a page of our PNN blog, but I am in the process of moving them over to our new blog at Grab A Book From Our Stack. Book reviews we do from now on will appear there and I will slowly being phasing out the page at What We've Just Read on PNN. I thought it would be fun to play around with a new blog and didn't want to change this on and My Funny Dad, Harry one because they were both custom made. If you like to read, we would love it if you would visit our new blog and get some reading recommendations or share with us what you thought of some of the books we have reviewed. Each week I plan to show our new stack of library books in the header. That way just by looking at the header, you can see what we are currently reading and what reviews will be coming up. We will intersperse new reviews with old ones we did from our PNN page. SPECIAL URGENT NEWSFLASH--CAN YOU HELP? : A friendly cat in Georgia is scheduled to be put down at the end of business June 30, 2010. See Sparkle's Hoping for a June Miracle post about it. No, this is not a fund for anyone named Roger. It is a special fund set up by Caroline’s Kids Pet Rescue to help stray and feral cats that have been injured or abused in any way. This is a cat sanctuary that takes care of cats without homes, even if they are hurt or test positive for FIV. Cats other shelters would put down are given care and shelter at Caroline’s Kids Pet Rescue. The only cats in cages are those under medical care. All the other, approximately 200, are free to be with other cats in a large room rather than in cages. Below is a video I took when I visited the home of these cats. They actually reside in a 2-story house all their own! Their cats are adoptable, but if they do not get adopted, they can live out their lives here. A friendly cat in Georgia is scheduled to be put down at the end of business June 30, 2010. See Sparkle's Hoping for a June Miracle post about it. Today we had our yearly check up with our regular doctor. I was happy that in one year I lost nine pounds. Those walks with Abby helped. Karen lost a couple pounds too and the doctor encouraged her to eat more. What's up with that? We both had to get poked with a needle so they could get a blood sample to run tests and schedule an Echo test which means we have to take off work again for that. Such a hassle! We were there for an hour and a half because the doctor was 20 minutes late and then they couldn't get enough blood out of Karen. The doctor said Karen looked a bit pale and thought she may be anemic so wanted to test for that. It was very cold in the doctor's office so Karen's veins were very small. The technician wore a fleece jacket! They must have had the air conditioning blowing at 60 degrees. When the technician couldn't get enough blood out, she sent Karen back to the doctor to try. He got a little more, but it was running so slow he gave up and wanted to try her right arm. Well, she didn't let him because the Cancer doctors told her not to ever have her blood pressure taken on the right arm or any shots or giving blood from the right arm. I also have to go see a foot specialist because I have fungus under my big toenails. I wouldn't have even mentioned anything but Karen wanted him to look at my feet because she thought something was wrong. Who do you think did better, Karen or me? Your comments are welcome. After the doctor trip, we ate lunch at Arby's, played tennis for about an hour and then took Abby to the park. It was a beautiful day! Abby lost some weight too--down to 45 lbs. 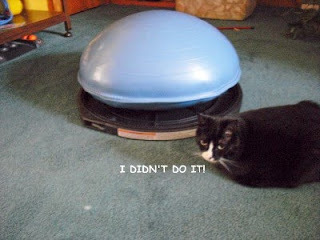 I went upstairs Wednesday morning and discovered my Bosu ball came apart! Now how did that happen and more importantly, how do I get it back together????? I had registered it online for a warranty so called the number and they asked if I had tried removing the rim. No, I didn't realize it came off but then I looked and saw the screws so said I'd try that. I had got our only pair of pliers out and after a bit, was able to unsrew it enough to get the rubber part back in the rim. In glancing through the directions, I saw it's not supposed to be left in a hot car. I think it just got too hot in our upstairs den and it lost its shape so now I am leaving it in the basement until I want to use it. I was just happy to get it back together again. I used to work at an insurance company years ago. The work itself was extremely monotonous BUT the people were fun. The best thing about the job and what made it hard to quit was the flex time and our Pinochle group at lunch. We played for a half hour Mondays through Thursdays and then took two hours for lunch on Fridays to go out to eat. We usually were able to get five players so we played three against two. High bidder could call for any one card and whoever was the first to have it was their partner. Then the two partners could exchange three cards—no talking. This caused the bidding to get very high on the hopes of connecting big and scoring a lot of meld. I remember getting double runs, and triple pinochle. We played with a double deck too which made it harder to keep track of what was played on the tricks. Pinochle became my favorite card game during this time. What is your favorite card game? Did you ever have a job where you had fun? This is in response to Mama Kat's Writer's Workshop prompt: It happened at work. On the bus one day I saw the funniest pair of tennis shoes. They had Rubic cube squares all over them. I really should have taken a picture but at the time, I didn't think I'd post about them. People really should wear clothes that fit. When walking on my break one day in downtown Cleveland I saw an overweight gentlemen eating at a sidewalk table outside the Chocolate Bar. He was in a suit so I assume he was a businessman, but his shirt button had popped open and everybody walking by could see his hairy belly button! Poor guy. I thought about taking his picture, but refrained knowing he would not appreciate that. On our trip to the zoo, it irks me how parents yell at their kids such as "Don't walk on the rocks," "Get over here RIGHT NOW!" "Stop petting the donkey, we're moving on," etc. The zoo should be a fun place! I love seeing the kids get excited over things. At the exhibit about poop, two little girls were having so much fun hitting the button that made the sound of a toilet flushing and posing behind a picture with the head cut out of someone sitting on a toilet. Then they got a big kick out of it when their dad put his head in the hole and made a funny face like he was trying real hard to go. I must say though, that I saw a good mom and dad too. It was a hot day so the mother brought along a spray bottle filled with water and sprayed her two girls to cool them off. 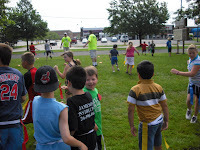 I am assigned to the first and second graders which is not the age group I like and enjoy working with. They are whiny, restless and I couldn't believe the boys were complaining about the ants in the grass! Yup, we are sitting on the ground having our devotions and the boys are complaining about the ants crawling on them. I don't like the ants crawling on me either, just because I don't want to be bringing them into the house but these are boys. It was just surprising to me. The first day is always hectic and a bit rough because they aren't grouped into teams yet and no one knows exactly where to go for the certain drills yet, but all this works out and the next few days runs much smoother. This morning though, the forecast is not good so we very well may have another confusing day. It's raining and was storming early this morning with a 50% chance of rain predicted for morning and 60% chance of rain this afternoon. We do have a rain plan in place; however, this will greatly limit what drills we'll be able to do. Please pray for me that I'll be patient and have fun with the kids, that it won't rain and that things will run smoothly. If it does rain, we'll be inside and hopefully will still be able to do at least some skills and drills. Today the kids get their free t-shirts. Chick-fil-a donated chicken sandwiches for all the kids to get one--about 749. Video and pictures are posted each day on the church blog at www.phbaptist.blogspot.com. What ministry or non-profit organization are you involved with? 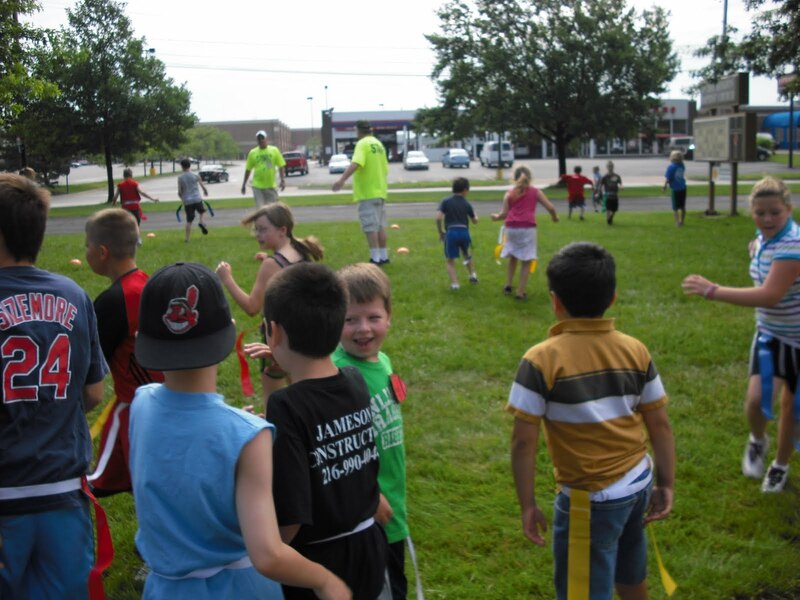 Does your church have any outreach ministry during the summer? G: You put cereal on your ice cream--eww! K: It's good! It gives it a little crunch. G: I'm getting the camera to take a picture. You HAVE to blog about this. So, what do you use for topping on ice cream? When helping with a Kid's Day Out at our church, I learned that cereal on ice cream as well as broken up cookies, or a broken up candy bar all make great toppings. Pam, our children's ministry coordinator, always lets the children make super Sundaes with all kinds of good toppings available to them. I am happy that Gerard is now looking for ideas for blog posts too! Does your spouse give you ideas for blog posts? Feel free to share a link to one in the comments. Smiling wasn't my dad's strong suit. This is a picture of him from the 60s on a Sunday. And ye fathers, provoke not your children to wrath; but bring them up in the nurture and admonition of the Lord. and two, because it was there to protect me. God's plan for the family is for every member to have a role and when each one carries out their roles the way God intended, it makes for a happy family. I hear some people remark from time to time that they wish there was a manual for living. Well, there is. God has given us instructions for living in the Bible--the Word of God. Last week I challenged my Sunday School class of 5th grade boys to read it every day and find verses that either tell them to do something or not to do something. I hope they at least tried and can share some of what they found in class today. Growing up, we went to church every week as a family--non-negotiable. I think I missed a total of maybe 8 Sundays my whole life from when I started. Some of those were when I was away at camp and the rest were when I wasn't feeling well. My dad did well at bringing me up in the nurture and admonition of the Lord. He also did well, for the most part, about not provoking me to anger. He lived a Godly life and was not a hypocrite. I only remember a few times when he provoked me to anger and that wasn't until I was an adult and his health was failing. 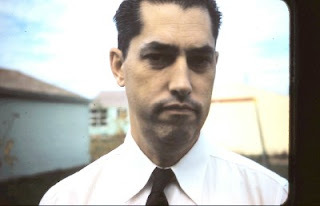 He sometimes refused my help with things that I tried to do to make life easier for him, such as hiring a cleaning woman once a month or changing his money in checking to a different account to earn more interest, or to pick up the mat or rugs that he could possibly trip on like the doctor said we should. Sometimes he was a very stubborn man! I believe any man who reads "My Funny Dad, Harry" could gain some pointers on what makes a good dad. Mine was very, very good! I feel very blessed to have had such loving and wise parents. Although Gerard and I don't have children, we do have pets and there are a lot of similarities in being a pet owner and a parent. 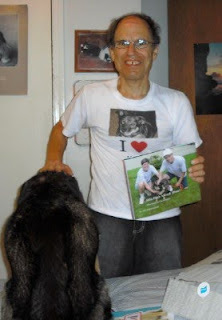 Our pets surprised Gerard with a very unique father's day present this year with a Blurb book: Early Father's Day Gift Was A Hit. What was your best Father's Day gift? For more posts about my wonderful dad, check out my other blog at "My Funny Dad, Harry." The link to it is in my navigator bar at the top and enjoy Father's Day. Spend time with your dad today while you can! Paige at Some Days You Gotta Dance is giving away some Etsy shop items in her "Christmas In July" giveaway the week of July 12-16. If you have a shop and would like to add something to her giveaway, there is still time. At About.com: Cats, I looked up the human age of our cats and learned that Manny is 36 and Spunky Doodle is 40 in human years. Find you your cat's human age using the Cats Age Conversion Chart. 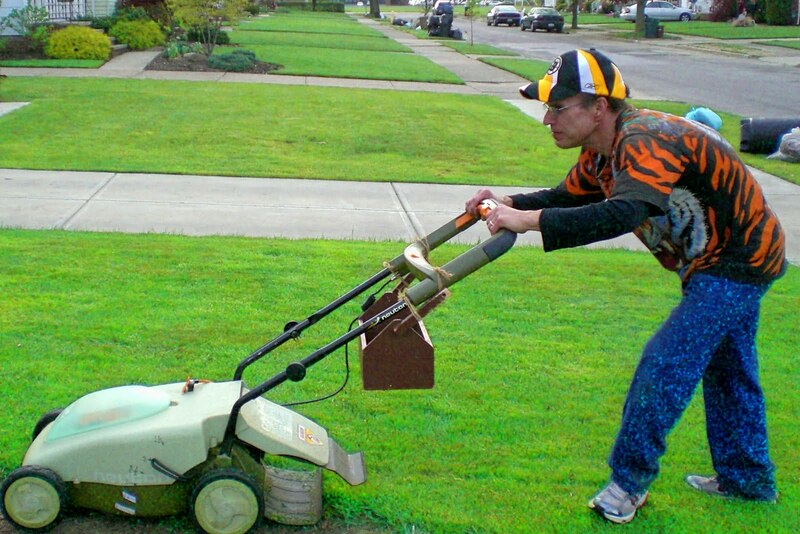 I thought our electric lawn mower just needed a new battery but apparently that was not the case. Now what? 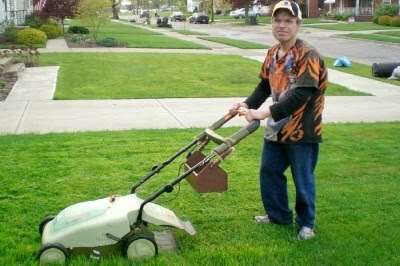 It just quit one day while Gerard was mowing. I called Neuton's support number and they gave me the address of one of their repair facilities that are in our area so we'll be taking it there tomorrow, hoping they can fix it or at the very least tell us what is wrong and what replacement part we need to order. Go to Sparkle's blog and vote for your three favorite shelter cat stories. There are 24 entries and it was a hard decision, but I finally picked just three. As of today, Moe has a long way to catch up. He only has 3 votes so far and the leader has 17! There are so many wonderful rescue stories! Our dog received an "Environmentalist Award" from Bartels Busack Pet Hospital Resort and Spa because they are donating her fur that came off her when she got groomed to Matter Of Trust to help clean up the oil spill in the Gulf Coast. Guess I should have saved all the fur I brushed off her during the week before. I had a whole bag full! Next Friday is "Take Your Dog To Work Day." I wish I could take mine but that's not going to happen at a big law firm. Can you take yours to work with you? Click here for more Friday Fragments. We were so relieved to hear that Mr. Moe did not die and that we could have him back. Our prayers were answered! Mr. Moe was our very first cat that we adopted from the Parma Animal Shelter. When he first came to live with us, he wouldn’t eat anything. He was eating Max Cat at the shelter, but would not eat it at our house. I lined up a variety of different kinds of cat food for him--a regular buffet, but he just sniffed and left. I thought he just needed some time to adjust to his new home, but it turned out he had fatty liver disease. He didn't eat for a month so was a very sick cat. He moved and played and let us pet him though so we didn't realize how sick he really was. He seemed perfectly normal except he wouldn't eat. We should have taken him to the vet after two days of not eating, but we were new cat owners and did not know any better. Eventually, after almost four weeks, we took him to the vet at the corner of our street but they did not want to help. I was in constant prayer for Moe that he would eat and be all right. The vet at the end of our street gave me some food in a tube that I was supposed to squirt into his mouth which Gerard and I both tried unsuccessfully to do. One of us wrapped a towel around him while the other tried opening his mouth and squirting it in. What a joke—Moe always got away with very little in his mouth. We kept on trying two or three times a day with no success. I was desperate and asked the corner vet if we could bring him in for them to do it but they said no. We just lived up the street right across from the place so I asked if someone could come over to our house to do it but they wouldn’t. They just said we should take him back to the shelter. I called the shelter in tears, and they took him back, assuring us that it wasn’t our fault and that they would try to save him. 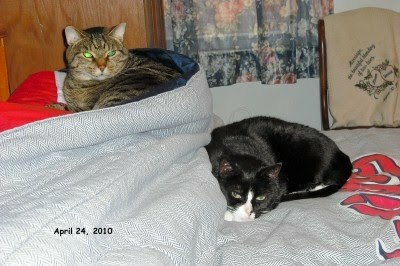 Their vet, Dr. Hart, took Mr. Moe home with her and force fed him for an entire week. He started eating on his own again. 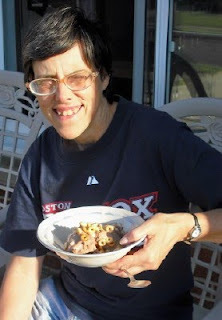 She called us to see if we still wanted him and said once they have that disease and get over it, they seldom get it again. We were so happy to get Mr. Moe back! Of course we wanted him! We went to Dr. Hart's and I still remember how happy I felt when she drove in with Moe on the seat with her. We'll always be grateful to Dr. Hart for saving his life! The shelter guessed that he was 8 years old when we got him, and he lived with us for another 7 years. We loved him very much and still miss him. 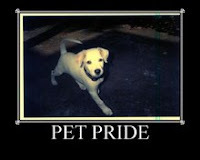 He went to the rainbow bridge the last day of 2007. You can vote for Moe's story in Sparkle's June Shelter Cat contest--there are 24 entries! This is in response to Mama Kat's Writer's Workshop prompt: Write about a happy reunion. Gerard loves to read and orders books ahead from the library online that he wants. Sometimes there is a long waiting list but eventually he gets the ones he orders. This week six came all at once! He brought a box along to put them all in; he cracks me up sometimes. The Cuyahoga County Libraries are having a summer reading program that both of us are participating in. The goal for adults is to read 40 books during the summer, but I don't think we'll get that many read. He discovered some children's books are fun to read and ordered two of those even. I liked City Dog, Country Frog by Mo Willems and friendship but did not like Say Hello by Rachel Isadora. It just showed how to say "hello" in different languages by have a girl and her dog go through her neighborhood saying "hello" to people of different nationalities. One of the books that had a long waiting list was House Rules by Jodi Picoult which finally came in. I plan to read that one too. Japan's obesity rate is only 3% as opposed to the U.S. obesity rate of 30%. This would indicate they must be doing a lot right when it comes to eating. Apparently those Suma Wrestlers are a minority and eat differently from others in their culture. The Japanese generally eat twice as much fish as they do meat as opposed to the U.S. eating 47% more meat than fish. Salmon, sardines and tuna are high in good fat. I used to eat tuna every day but loaded mayonnaise. I like salmon but once I got sick one day when I had it for lunch and since then my husband told me not to eat that anymore. I like sardines with mustard so I could see adding these to my diet. Japan is a veggie nation. They cook as opposed to me who does not. They eat lots and lots of vegetables. Mostly, the only vegetables I get are through the V8 Fusion drink. Oh, I do have salad two or three times a week now which is an improvement. So I have cucumbers, lettuce, eggs, tomatoes, flax seeds, carrots and green peppers with no dressing! Japan eats rice in place of potatoes. In the video, Natalie says rice is a good carbohydrate. Even though they eat white rice. I like rice okay, but much prefer mashed potatoes which I have on special occasions. Portion size & Speed. Here is an area I can actually improve. Japan has smaller portion sizes generally than the U.S. and eating with chopsticks slows them down. All those vegetables takes more time to chew too. I try to keep my portion sizes down, but fail when it comes to scrambled eggs and bread pudding at Hometown Buffet once a week. Their bread pudding is SO GOOD and I figure eggs are one healthy thing that I really like to eat so I stock up on those. I usually eat a very quick small supper. I gobble my lunch while reading the newspaper, in a hurry to get outside or read my book. The only time I eat slow is breakfast on Saturday at Hometown Buffet when I'm not in a rush. Dessert: The Japanese usually have fruit for dessert--LOL! Of course, the U.S. has lots of dessert choices, most loaded with sugar. That's what makes them taste so good: bakery, ice cream, candy. I go in spurts on this. I can do without these things for only so long. Again, I do try to watch portion size and frequency but lately am not doing too well on the frequency. It's so hard for me to pass these by. Fruit just isn't the same. Variety: The Japanese do not eat the same things every day (like I do). They eat 30 different foods a day and 100 different foods a week! All those different vegetables add up. I am doing good if I eat 10 different foods a day! Our grocery list is pretty much the same every week although last week, I did add something new that we haven't had in a very long time: Gelatin cups and Weight Watcher's dark chocolate raspberry ice cream bars! Finally, here's the biggest difference of all: the main drink. Can you guess? Japan drinks Green Tea, the U.S. drinks soft drinks. I have cut out pop but do drink the V8 Fusion (for vegetables & fruit). Mostly I drink water and milk but could not stand the Green Tea. I really did give it a try. The video is long but so well done that it kept my interest all the way through. She also goes into the difference in flour and sugar consumption. If you have some time, I think you would enjoy watching this. How do you do at incorporating some of the Japanese eating habits into your lifestyle? What did you think of the video? 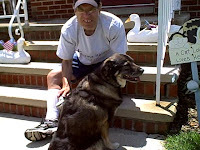 Today the pets surprised Gerard with a book for Father's Day this year that our dog, Abby, wrote with my help. We went to www.Blurb.com and used Abby's blog. I am so pleased with the quality of this book! This was easy to do and I loved that we had complete control over the layout, the fonts, the colors, the size, everything! It came in less than 2 weeks after I ordered it and it was very hard not to blog about it and not to give it to Gerard right away. Have you heard of the snail mail project? If you like getting non-junk mail and enjoy brightening others day with a card or letter, you should check out this snail mail project at Putting The Fun In Dysfunctional. I learned that Abby's foster mom will be at "Meet Your Best Friend" at the Cleveland Metroparks Zoo tomorrow from 10-4 and we'll get to see her again. 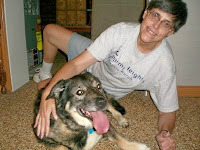 She will be there with her Canine Lifeline group which she started up shortly after she brought Abby to us. Canine Lifeline does not have a shelter. All the dogs are in foster homes waiting to find their forever home. Over at He Said, She Said Camera Shy I learned that Oprah and Mark Burnett are searching for the next big talk show host. Worth checking out if this is something you always wanted to do. You need to submit a video and go to a live casting call. Get details here: Oprah Wants To Hear From You. Even if you don't want to try out, you can go and vote for the video you like best. I think Helene at I'm Living Proof That God Has A Sense Of Humor should go for it. Obesity and Diet: Japan vs. U.S.
At Dietivity.com I watched a very interesting video comparing how the Japanese eat to how Americans eat. No wonder Japan's obesity rate is just 3% (the lowest in the world) compared to the U.S. at 30%. Japan must doing something right. I'll be doing a post about this soon but in the meantime, you should watch the video. 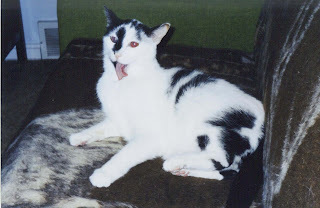 I found out that Sparkle, a blogging cat, is having a contest to win his book: Dear Sparkle, Advice From One Cat To Another. To enter, just leave a paragraph in the comments about your adoption story at My June Shelter Cat Contest. Today I discovered The Sweetest Thing at Confessions of a Pioneer Woman. It's a lovely post about a boy and his dog that received 400 comments! The most I ever got on a post is 20 something. This is just a wonderful thing to me that people take time to comment on such a light, wholesome post such as this. Click here to find more Friday Fragments. 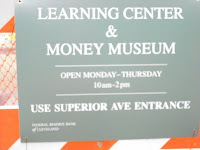 I just discovered that the Federal Reserve Bank in downtown Cleveland has a free Learning Center and Money Museum inside! Out of curiosity as to what would be in a money museum, I took a peek on my lunch hour. Upon entering, my belongings were x-rayed and inspected, I had to show a photo ID and pass through a metal detector which I found a bit creepy. Once past that, I was directed to a reception area where I received a visitors guide and warmly welcomed. I was expecting to just see a big coin collection but it was much more interesting than that! 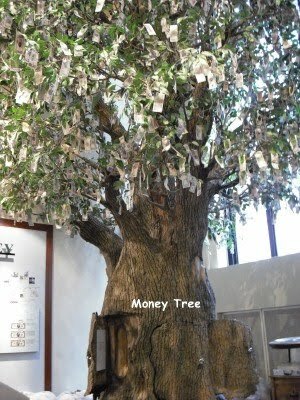 It had some hands-on exhibits that showed the need for money, the history of money, spotting counterfeit money, the art of money, how checks work, how savings add up and the job of the Federal Reserve Bank. I went back to take my time to really check out the exhibits more thoroughly yesterday. I particularly liked the bartering game but gave up on it because it was taking too long, thus proving the need for money. There was even a money tree! There was a movie running that explained the four characteristics of money: durability, divisibility, recognizable and something else but I forget now what it is. 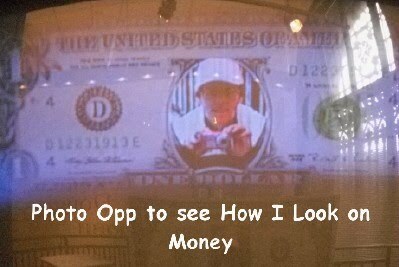 At the top of the stairs were more exhibits and a big dollar bill that you could stand behind to see how you would look on a dollar bill. I was by myself so had to just take a picture of my reflection. It is only open from 10-2 p.m. Mondays-Thursdays but would be a worthwhile trip. (Groups of 10 or more must make reservations in advance.) Video equipment is not permitted, but cameras are. It's nice to have a garden in the midst of all the tall office buildings in downtown Cleveland. I really enjoy going to the library garden on my lunch hour and reading. I love the peacefulness there, the comfortable chairs, the trees that provide just enough shade and the gurgling water. Sometimes I even doze off and get a short cat nap in. 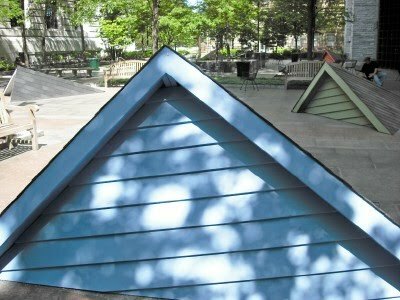 On break one day when I walked over to the garden I saw people painting five oblong pyramids that had shingles on two sides and wood on the other. What puzzles me is why these roof shaped things were put in there. There are five of them spread around the garden, each a different color. At first I thought they were going to be storage areas for something but there are no doors. I suppose people could sit on top of them, but they do not look comfortable to sit on. I see no purpose for these so I assume it is meant to be art. Personally, I prefer the open space. To me, these look out of place and give the garden a cluttered appearance. What do you think of modern art? Do you think these look good in the garden? Am I missing something here? It seems our spending goes in spurts. We can go for a long time just buying the necessities but then the dam breaks and we spend like crazy. This happened in the last few weeks. It started with just a new battery for our electric lawn mower, then some new batteries for our smoke alarm. Then we had to buy flowers for our yard to get them planted before Memorial Day. I ordered a father’s day gift for Gerard from our pets the same day we went to OfficeMax to get a big poster of Abby since they had them on sale. It turned out great and is even bigger than our cat enlargement posters but they were out of the glossy paper so we got it laminated which brought the cost up to around $40--we skipped the frame. We decided to get the DVR feature from DirectTV for our basement TV too which involved paying for new equipment and the installation. At least the customer service representative gave us a $100 discount on the equipment! It is about 10 degrees cooler in the basement so for the summer, it will be nice to be able to watch taped shows down there. Then, of course, there was the Memorial Day Sale at JC Penney which Gerard went to for some new shorts. Unfortunately, I went along and he also found ties on sale. Some were 50% off, others were “buy one, get another at 50% off.” He got two, a red one with hearts on it that he chose and a plain white one that I chose. That “sale” trip cost us $87! Then the sudden death of the father of one of our church families tugged at my heart strings to contribute to the love offering for the wife left with four children and no job. Tuesday night while printing my newsletters, the printer ran out of ink so I had to make a special trip to OfficeMax for more ink. Each color is $14 and I bought four. It being the end of the month, I had to refill my Femara prescription for $350. Oh, and I finally gave in and bought new computer speakers? We didn’t even call the plumber yet for our kitchen sink. It drains, but very slowly so the last three months Gerard has been washing our dishes in the basement. I think it’s time to get the kitchen drains fixed. Then, over the holiday weekend, our bathroom light switch doesn’t stay off so we had to tape it. It’s also time for Abby (our dog) to have a spa day again and get a bath and haircut. What are you spending money on lately? 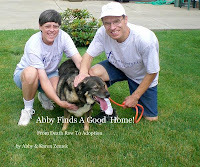 Yesterday we took Abby up to the Parma Animal Shelter's adopt-a-thon. They had a bake sale, food, lots of prizes they raffled off and for $5.00, you could get your dog blessed by a Priest on the tennis courts next door, participate in their dog walk and get a goodie bag filled with dog toys and treats. Abby had a great time meeting lots of other dogs and it was fun for us being with so many dog lovers! I counted about 25 dogs that participated in the dog walk and animal blessing. Abby's tail was going the whole time and had a big smile! I hope you enjoy the video. I know it's kind of long, but I wanted to show all the nice dogs that came out for this event. I was very surprised that the dogs were not barking constantly. We were very proud how Abby walked right with Gerard very nicely and did not bark at any other dogs, just sniffed. We are so glad we decided to get a dog and look for the perfect dog for us on Petfinder. Maybe it's time you checked out what's available. If you can afford the food, treats, and vet care, a dog is a wonderful addition to a household. Did you know there is a cell phone that is actually just a phone which is all we need and there's no contract! It's called the Jitterbug. Gerard found an ad for it this week. You can place and receive phone calls--that's it. The price is a little over half of what we are currently paying for our Sprint phones. When our contracts are up, we are planning to switch. Did you know most people take time to watch videos on blogs? Thanks to my poll on here asking if you watch videos on blogs, I learned that out of the 16 who responded, 5 usually watch, 10 watch sometimes and 1 rarely. I guess it is worthwhile to post them. What do you think about them? Do you post videos on your blog? Do you make your own or just copy someone else's? We listed some of our better videos on the right sidebar for your convenience. Did you know June is adopt a Cat month! See what's available near you by using our Pet Finder widget on our left sidebar to search for available cats in your zip code area. Or you can also search for a particular breed. Did you know you can use a Google Alert to find posts that mention certain words? Through my Google alert, I found a post about my book: "In My Funny Dad, Harry, Karen Arlettaz Zemek Shows How Love of Family and Faith in God Will Get You Through The Tough Times." Did you know there is still time to get in on the giveaway for an autographed copy at "A Special Father's Day Giveaway at Red Pine Mountain." Did you know May was a very good month for the Red Sox? they got back in the race and as of June 1 they are just 5 games behind. The offense is not as bad as some predicted and "Big Pappi" is heating up. How do you feel about your favorite baseball team? Did you know there is a Learning Center and Money Museum free to the public inside the Federal Reserve Bank in downtown Cleveland? I just noticed it this week and decided to check it out. I don't know if all of them have a Learning Center and Money Museum or not.